High Quality Content by WIKIPEDIA articles! 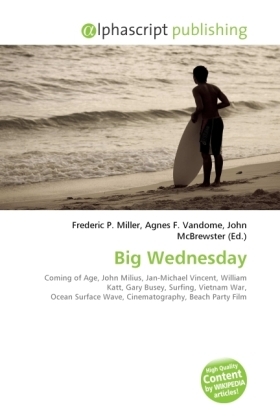 Big Wednesday (1978) is an American coming of age film directed by John Milius. Milius co-wrote Big Wednesday with Denny Aaberg, and it is loosely based on their own experiences at Malibu and a short story Aaberg had published in a 1974 Surfer Magazine entitled "No Pants Lance. The picture stars Jan-Michael Vincent, William Katt and Gary Busey as California surfers facing life, the Vietnam War, and use of the ever changing surf as a metaphor for the changes in life. Surfing aficionados consider it to be one of the best surfing-related films made, in part because of the surfing cinematography and the appearance of several world champion surfers as stunt performers, plus its verisimilitude, especially when compared to the kitschy 1960s Beach Party films. The director, John Milius, had been a surfer in his youth. The film also examines the extremes which some young men went to during the Vietnam years to avoid being drafted and shipped off to war, including: faking insanity, homosexuality, and all manner of medical ailments.